Oh student loans! It seems like everyone has them. How much do you have? I have plenty of student loans. I received 2 undergraduate degrees and finished my Finance MBA just last summer, and altogether I accrued around $40,000 in student loan debt. Even though I graduated with my Finance MBA just last summer, I did make myself a pretty intense goal of paying down my student loans this summer! Have you ever actually sat down and totaled altogether how much you have in student loans? Most people couldn’t say exactly how much they owe. I was one of these people. I had a general idea, but when I actually sat down and added everything together, it was a little higher than I thought (okay, it was a lot higher). Adding everything together will help you get on your toes and be more realistic with yourself and your budget! One of my friends didn’t know how much she owed until around 6 months after she graduated and she received a payment book in the mail. It listed out all of her loans and totaled everything altogether. For the longest time she was telling everyone that her schooling was very cheap and that she didn’t owe very much, turned out she owed $34,000! Yes, $34,000 and she didn’t even realize it! She took out small amounts every single year and didn’t realize how quickly that it had actually added up. 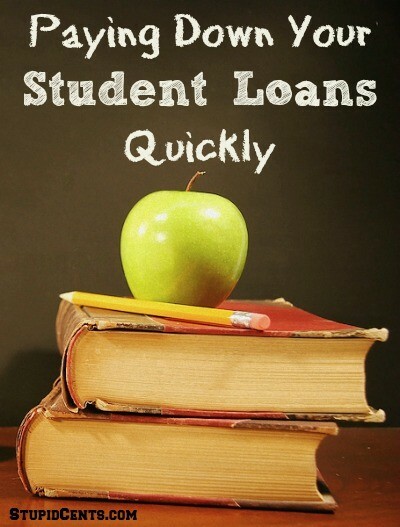 One thing that I did with my student loans was sign up for automatic withdrawal so that I could have a lower interest rate on all of my student loans. It cut everything by 0.25% which is definitely better than nothing. If you owe a lot of money in student loans, 0.25% can be a great deal every year. Would you say that you are “good” with your money? If not, or if you hesitated with your answer at all, look at your budget. Or make a budget if you don’t have one. Track your spending and see what areas you can cut. Pay yourself first instead of paying other expenses. This means that you should try and dedicate a certain amount of money towards your student loans every month, and put payments towards your student loans FIRST every single month. For some people (and me), having less money in the bank will make me more cautious about what I’m spending. Try this! Making extra money is definitely something that we are working on. Without extra income, I do not think that I would be anywhere near the payoff date for my student loans. I throw almost all of my extra income towards student loans (hey, I want to enjoy some of it) and this helps me because I don’t miss this money as much since it is all extra. There are so many different ways that you can earn extra money. Just one year ago, I never thought that I would be making anywhere near the amount that I’m currently making. You can staff write on websites, work at a retail store, babysit/nanny, mow lawns, walk dogs, sell items online and so on. The possibilities are endless! Do you have student loans? What is your plan for paying down your student loans? Thats really good advice for me because I have large student loans and I will definitely set up automatic payments so i can have a lower interest rate. I think I will have to take another part time job so i can quickly pay off my college debt. Finding another part-time job is a great way to pay them off. Good luck! I actually just graduated at the end of April and will have to start working away at my student loans soon. Definitely something at the top of my mind and I really need to develop a strategy for paying them off. Honestly your student loans aren’t very high considering the amount of schooling! This monster debt is really hurting young people. As a tax professional let me add this. The tax credits that were supposed to help people have been reabsorbed by the colleges and universities in higher tuition and fees charges. Until the tuition can be rolled back to affordable levels your sound advice is the best that can be done!